What Does the Universal Scalability Law Reveal About MySQL? In the last couple of weeks, there have been a few blog posts about benchmarks comparing the performance of various versions of MySQL and variants such as MariaDB. There’s also been some analysis of the results using formal models such as Neil Gunther’s Universal Scalability Law. What can the Universal Scalability Law (USL) teach us about the performance characteristics of these systems, as revealed by the benchmarks? To find out, I’ll examine one particular benchmark, MariaDB 10.1 and MySQL 5.7 performance on commodity hardware. The context for this benchmark, in a nutshell, is that MySQL 5.7 was just released as GA, and the published performance results are spectacular, from the point of view of throughput on large servers. 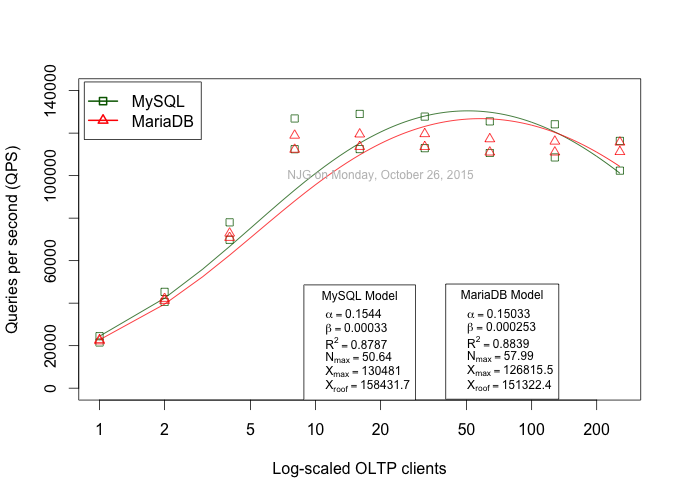 Although this is good, showing that MySQL can scale to do lots of work on large servers, the MariaDB benchmarkers wanted to understand how a simple benchmark would run on a typical commodity server. This server can run only 8 queries simultaneously. After that, adding more connections trying to run queries is not going to improve things. The USL doesn’t include parameters that model the fixed size of underlying hardware and other resources, and as a result, it’s very common to find some type of resource saturation that creates a ceiling it doesn’t predict. This is a perfect example. 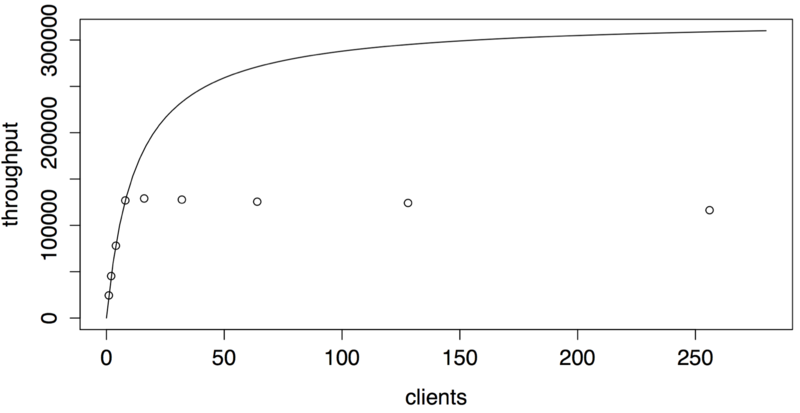 As I discuss in my new 50-page ebook on the Universal Scalability Law, it’s rather pointless to try to use the USL to assess behavior beyond a saturation point such as the one you can see in this benchmark. That’s why fitting the USL to the data up to and including 8 connections is the right approach. Beyond the saturation point, all you can see is whether, under increased queue length, the server stays efficient or wastes effort. Most servers lose efficiency. To find out exactly what causes this, please read the ebook I linked above. There’s such a small kappa coefficient that it should be ignored, however, sigma is about 7.4%, which is quite significant and limits performance very seriously. If you’re familiar with the USL this provides concrete ideas about what needs to be changed, and defines how far you can scale this server on this type of configuration. When I was at Percona in the 2009-2011 timeframe we made a business out of finding and alleviating those kinds of bottlenecks, which is what led to XtraDB and eventually to Percona Server. When a system hits an obvious ceiling, don’t try to fit the USL to the data beyond that point. Especially when you know the hardware explains the behavior simply. What happens beyond that point does indicate something about the server’s ability to go beyond saturation without completely spitting its cereal. We see essentially a flatline here, but in older versions of MySQL we used to see serious retrograde scalability. 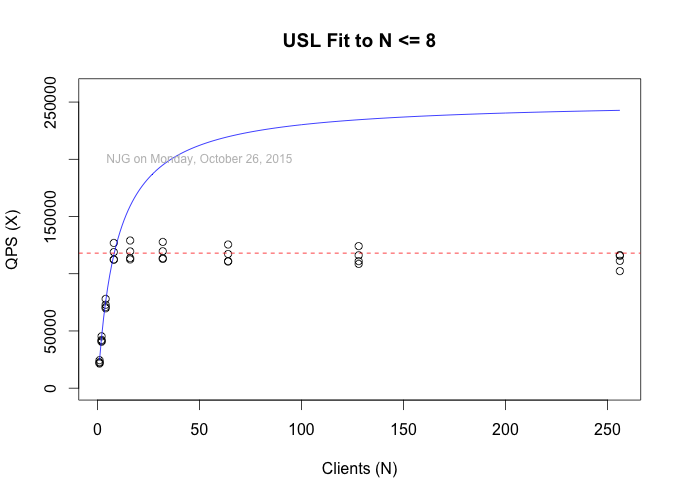 The USL’s parameters point you in the right direction to find and fix scalability problems. There are lots of weird and contradictory results for lots of benchmarks. Benchmarketing is everywhere. 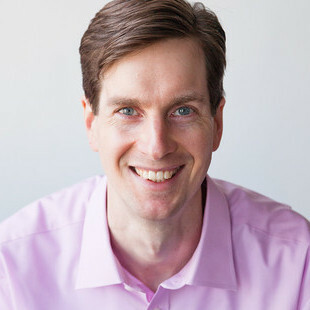 Learn about the Universal Scalability Law and innoculate yourself against lots of brain twisters.